I fill with FEAR even thinking about it! 11 years ago I packed my kids up in a 22 foot U-HAUL with all our belongings and we moved across the country far away from my adoptive mom where she couldn’t spin her sick and twisted mentality on my children and on my life any longer. I consider it an escape. If you knew all I know about my life, my child hood, and the pain and anguish this lady has caused me you would consider it an escape also. I was alone when I made the biggest, hardest decision of my life. This one decision would impact the rest of my life and the rest of my kids’ lives. I had to make a choice. Move away and have no family ties in the state we were moving too, or stay and my kids would experience all the trauma, emotional manipulation and mental sickness that my adoptive mother is filled with. If you are curious of all the dynamics please read The Narcissistic Adoptive Mother . I won’t go into all the details here because it would take too long. This decision is one my kids still don’t quite understand because they escaped, and they didn’t experience all I did. I AM SO GLAD THEY DIDN’T EXPERIENCE ALL I DID! What they understand is they left the only grandmother they would ever know and one that they spent a lot of time with the first part of their lives. Because of this it has created a space of confusion for them and I hate being adopted because of this. Why should my kids have to suffer just because I got dealt a raw deal in the mother area? Regardless, I do not regret moving them/us away so they could have a better life. I understand they might not fully understand because they didn’t experience the other side as much as I did but when I noticed my adoptive mom starting to make them rub her back, massage her body and do inappropriate things I knew it was time to go. We raise our kids to have compassion, and to be kind and to love others, especially their grandparents. Well it’s hard for them to understand and it’s something that I struggle with because I don’t ever want them to fully understand because that means they didn’t experience as much as I did. I’m thankful for that. The flip side is that in there little sweet hearts, they just want their grandma minus all the BS! It hurts them, and it hurts me to see them hurt. I had to make this choice for my kids and I and now that they are adults they can make their own choices. It was my job as their mother to PROTECT THEM. That’s exactly why I moved far away. My adoptive dad and his wife have always lived far away and I have a little bit of a relationship with them. When I was 1 my adoptive parents divorced and my adoptive dad remarried. As an adult in my 40’s I can’t help but question WHY. Why did he leave us with this lady and HE KNEW how crazy she was? THAT’S WHY HE DIVORCED HER! He KNEW what she was capable of, but to this day most of the trauma and drama that we experienced was kept hidden from him. Within the last few years I had a talk with him. I was curious what the beginning of my life was like. I said, “How was she as a mother when I was a baby?” If you do the research you will know how critical the bond between baby and mother is ESPECIALLY at the beginning of life. When the original bond is broken, a trauma occurs. For me, I always wondered if I bonded with her, because I didn’t feel like I bonded with anyone, especially not a mother figure. He said, “When we got the call for you to be adopted, you should have never been adopted. (He wasn’t being mean, he was just being truthful!) Your “Mother” couldn’t even take care of the first baby (my adoptive sister that was 11 months older) but she wanted another baby. She had to undergo a psychological evaluation but somehow she passed. And we were able to adopt you. After that everything went to hell in a hand basket!” — WOW. It’s unbelievable that this woman was able to adopt even after she couldn’t take care of the first adopted child. And then my adoptive dad left got remarried and moved over an hour away. My adoptive sister and I were left ALONE with this MANIC DEPRESSIVE NARCISSISTIC WOMAN who not only tied us to chairs with dish towels, but tried to commit suicide over and over and made us her personal slaves taking care of her day in and day out. Through my child hood I went to my adoptive dad’s house to visit every other weekend for the duration of my child hood. He took us on vacations; we camped and traveled a lot. He let me be a kid. He was always amazing in my eyes, aside from one thing. I remember about my adoptive dad’s house was that they have always favored and I have experienced the pain from this first hand. I was on the opposite side of the one child that was always favored, as well as the rest of my adoptive siblings. IT HURT! I never wanted my kids to feel the pain from being favored. If you favor kids or grandkids you need to stop! It causes lifelong pain and trauma! STOP STOP STOP! I was an adopted step child and many times I was treated as such. There always has been and always will be a favorite in their eyes, even with the grandkids. I spared my kids the pain from experiencing this and made the choice not to move where this was happening. I wanted better for them. If we were in Kentucky all alone with no family I could protect my kids, give them a better life than what I had, no family drama and manipulation. We have a church family here. We have a church home. God has put some amazing people in our lives who are our family. We are thankful. Again, refer back to the Narcissistic Blog post. There is no point in taking my mind to “I wish, I wish”. There is no wishing in this game of adoption. Not for the adoptee anyway! We have no wishes, no choices, and no say so. We have no rights. I had no choice in moving away if I wanted better for my kids. Today I have 110% control over my life, and who I allow in it and who I allow to manipulate me and hurt me. I teach my kids the same thing. My adoptive mom is at the top of the list of people who has hurt me, way before I grew up and started acting out on my pain and I began to hurt others out of hurt, anger and pain from my child hood traumas I experienced growing up. My adoptive mom is the biggest trigger I have in my entire life. I think of her coming close to me or my kids I fill with a fear I can’t even describe. The last time she was here it was literally like the devil showed itself up at my doorstep. I am not kidding either. She brought her pill addicted self to my home and tried to create drama and a wedge between my kids and I and was full force into her manipulation tactics, manic depressive episodes, and craziness that I grew up in. This was August 2012. When she left my home at this time I told her she was never welcome in my home again and if she wanted to see her grandkids she would need to get a hotel room. I NEVER want my kids to see their grandmother lying around lethargic clinging to her prescription pill bottles tighter than she is clinging to anything in this lifetime. WHY CAN’T SHE JUST BE A HAPPY HEALTHY NORMAL GRANDMA? I always have hope that people can change, but she is someone I don’t believe ever will. Her mental illness, pill addiction and manic depression is too severe and she has never been treated for any of the root issues regarding all these things or these things in general. Growing up I didn’t understand! Now that I am grown up I understand! She’s SICK. And in the process she has just kept destroying lives, and somehow in the middle managed to adopt 2 kids! She always said, “Your birth mother made my dreams come true to be a mommy”. Talk about a mental mind F$%K for a child. I wanted to know my birth mother, to see her to be near her. I wanted my birth mother to be my mother. But my biggest loss was my adoptive mother’s biggest gain. I hated her for many years of my life because of all the hell she put me through. She was never a mother, and I never bonded to her at all. She made my skin crawl and still does. I was always the one who took care of her, telling her “It’s going to be okay mommy!” as she cry day in and day out about everything you could imagine. Let me share, I remember my entire life her having “Talks” with me about never wanting to go to a nursing home. These talks go back all the way to me being a little girl. I never understood how random this was until I grew into my adult life. One year after my escape, she drove to my door to visit my kids. She wanted to have another “talk” with me. She was only 60 years old at the time. She wanted to know if I would be her POA and agree to take care of her in her elderly years. She was trying to have this “serious” talk with me and try to manipulate me into being her POA. Does she even understand what that might look like coming from me? That’s a whole different blog post! First of all, I have 3 SMALL children and I am a single mother barely making it back in 2005! I was on public assistance, welfare, didn’t even have a car at the time. BUT SHE- THE ADOPTIVE MOTHER drove all the way to KENTUCKY to have this “TALK” with me about HERSELF and HER ELDERLY CARE WHEN SHE WAS 60 years old! I was blown away! I told her there was no way under God’s green earth that I was going to agree to ANYTHING regarding her care! We shouldn’t even be talking about this with her being 60 years old. I was 30 for God’s sake! With 3 small children! I quickly caught on to her scheming and manipulation tactics. We hadn’t even had a relationship since I escaped! My hands were full with my kids, and I found it extremely offensive she never took anything into consideration but HERSELF. It has taken me 37+ years to forgive this woman. I have forgiven her back in 2012. I refuse to carry any hate towards her. I feel sorry for her. I pity her. She’s an addict and she’s mentally sick. Her doctors have completely failed her and she has manipulated every single person she has come into contact with, even churches and pastors! I have seen it with my very own eyes growing up and as an adult. I learned as a child to disassociate my child self to a grown up self. I had no choice. When I was dealing with a hysterical manic depressive “Adoptive Mother” what choice did I have? Today, I am at a place of peace with moving away although I will always have sadness regarding having to make this choice. WHY WAS I EVEN ADOPTED IF THIS WAS GOING TO BE A CHOICE I HAD TO MAKE? I feel like an adopted orphan and there comes a lot of pain with this! Not just for me but for my kids. I still get angry sometimes knowing my kids have to experience even a little of the pain I do. I get sad, and I hate adoption because of it. Yes, I have a hard story and so do many of my fellow adoptees! But I have had to make the choice to move forward with my life! When the sadness comes, I acknowledge it because trust me, NO ONE ELSE WILL! Adoptees are ALIENATED in how we feel! There is no one to share it with aside from one another adoptee. The point of this blog post is to ponder what to do when my ailing adoptive mother is having issues, is in rehab and she is “ANGRY” my kids or I haven’t run to the rescue. By way of a 3rd party to one of my kids her POA has given multiple messages which I believe are somewhat manipulative and of course my kids want to know “WHAT DO I DO?” At this point my kids are all adults. I do not want that lady anywhere around my kids because she’s extremely dangerous with her manipulation tactics and she has many times tried to create a wedge and start drama between my kids and I, not to mention do everything in her power to guilt my kids into feeling sorry for her. WE DON’T HAVE DRAMA UNLESS SHE’S HERE! When she rolls up it’s like my child hood flashing back accept it’s with my kids in it! It’s BAD! Very VERY BAD! And then here she comes out of nowhere expecting my kids and I to drop our lives and come running. I am blown away! There is NOTHING I can do for her because she has done NOTHING to help herself. She is still addicted to prescription pain pills, and manipulating everyone around by her hypochondriac sickness, manic depressive episodes, sleeping all day being awake all night. If I tap into the little girl that so desperately wanted a mommy back in my child hood I get pretty sad and part of me wishes I could do something for her. I wish she was the mother I always dreamed of. If she was a “GOOD” adoptive mother I would love to move her here, take care of her, and make sure she was taken care of! BUT SADLY I never got the mother I deserved, as many people in life don’t. I was never comforted, protected, or loved the way I needed to be loved. She said she loved me but her actions showed the opposite so I grew up never knowing what LOVE felt like. After all, when you LOVE SOMEONE “SO MUCH” you hand them over to strangers to raise? As soon as I tap into that little girl who wants and misses her mommy, HER REAL MOMMY, I remove myself and come back to REALITY. THE TRUTH IS MY ADOPTIVE MOTHER HAS NEVER BEEN A MOTHER. SHE ISN’T CAPABLE OF BEING A MOTHER. SHE ADOPTED ONLY SO HER KIDS COULD TAKE CARE OF HER. What I have considered doing is that when she gets to the stage of not being able to destroy lives anymore, and when she is out of her mind I would consider it then. But as long as her mouth piece keeps running and manipulation keeps flowing from her lips I will have no part of her life. I just can’t. The first 31 years of my life were catering to her, moving her, caring for her, cleaning for her, slaving for her, everything was about HER HER HER! I am here and alive. I have 3 amazing kids and one of the biggest joys of my future is having my kids grow up and having wonderful relationships with them and having grandkids in the future. We are our own family. I encourage my kids to surround themselves with HEALTHY PEOPLE and HEALTHY RELATIONSHIP! I encourage them to set boundaries with people if they aren’t healthy. If people can’t abide by your boundaries you have every right to cut them out of your life. YOU DON’T OWE ANYONE ANYTHING!!! I DON’T OWE ANYONE ANYTHING!!! I DIDN’T SIGN ANY ADOPTION PAPERWORK! I have prayed to God, asking Him if I am supposed to be the one to step up and do something to “CARE” for the woman who adopted me but never cared for me, only emotionally and mentally abused me I would like him to please SHIFT MY HEART back to the little girl who has compassion and love for this lady who stole so much. I have never felt FREER in my life than the moment I had that truck loaded, and drove all the way across the country and I had my babies with me. The FREEING feeling is something I can’t even describe. I believe the best way is the understand that I broke free from a toxic situation to FREEDOM but it was extremely difficult to get to that point. I had to have MUCH faith in God and put my hope and trust in him. When we arrived back in KY we had no home, no money, no bank account, no keys to anything, no car, no job, ONLY MY KIDS AND I AND OUR BELONGINGS! We stayed at my twin’s granny’s house for a few months; slowly God began to bless us. DON’T FORGET I HAD A LIFETIME OF TRAUMA DEEP INSIDE STILL BENEATH THE SURFACE. CHILDHOOD TRAUMAS SO DEEP I COULD MAKE A LIST! But GOD… He blessed us, I was able to get a job, a car, a place, and we have been doing well ever sense. I HAVE FINALLY ESCAPED AND MADE SOMETHING FOR MY KIDS AND MYSELF. On the outside things have been pretty good, but deep inside it’s taken me the last 4 years in recovery to scratch the surface on all the pain adoption has caused me! 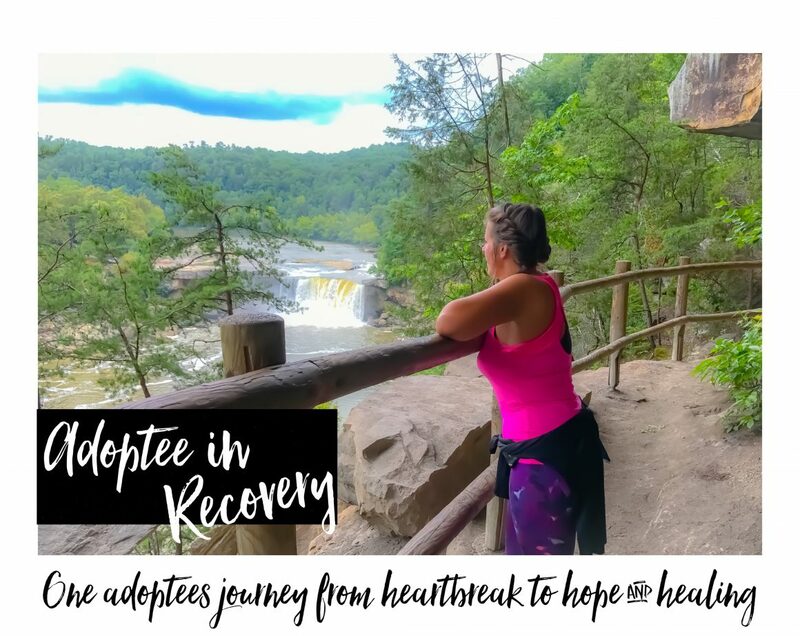 I am in acceptance mode that this recovery journey is going to last a lifetime and things might not get easier anytime soon. I have 31 years of conditioning I’m breaking FREE FROM. 31 years of anger, rage, hate, self-hate, abandonment, rejection, abuse, physical, sexual and emotional from my lifetime. 25+ years of my life I was a heavy drinker because I JUST COULDN’T FEEL THE PAIN OF MY PAST. So today while my adoptive mother has fallen, gone to a rehab nursing home and she is making demands that she hates to be there and via a 3rd party is doing her best to manipulate my kids which in return she knows will get back to me I STILL FEEL NO OBLIGATION TO RUN TO HER AND START TO PICK UP WHERE I LEFT OFF WHEN I ESCAPED IN 2005 AND BEGIN TO TAKE CARE OF HER AGAIN. I TOOK CARE OF HER FOR 31 YEARS. I am finally at a place where I am going to start living my life, all the life that was stolen when I was a child and up until I was 31 when I escaped. I have never started living life yet, and I have 3 amazing kids who are all adults now. I feel our relationships are about to get stronger and better. So far I’ve been mother and father to them, a role that is one that is TOUGH because a lot of times they don’t like me because I have to put boundaries into play. But if our kids like us all the time we aren’t doing something right! But I am already noticing a change in our relationships where we are getting closer because I’ve had to take a step back in some areas because they are ultimately going to choose what path they are going to take in life and now I believe we are going to become closer as friends, at least that’s what I feel and hope anyway. I PRAY A LOT FOR MY KIDS. GOD GETS THE GLORY EVERYDAY for bringing my kids and I where we are but I cannot and will not let the enemy come in and STEAL any more of my life than what he has already stolen! HE’S STOLEN A LOT! God is GOOD and GOOD things have happened since I escaped and he’s going to bring MORE GOOD as we move forward. I pray for my adoptive mom and at this point that is truly what I feel God is leading me to do for her. Prayer is powerful and prayer changes things. I pray God help her heal from all the sickness she has had my entire life. I pray God change my heart if I am supposed to go help take care of her, or bring her where I am to take care of her. At this point even thinking about it causes me great stress, anxiety, and emotional and psychological wounds that aren’t fully healed come whaling back to my mind. I clearly don’t believe God is calling me to do anything at this point. She has blood family in Iowa. She has a sister, nieces and nephews; she has a power of attorney. She has friends, a pastor and the adoptive sister I grew up with has a relationship with her. So there are other people who have relationships with her who can step up and care for her. I am deeply saddened that even from her nursing home bed she is still trying to manipulate and make others, including my children feel GUILTY she is there. We live states away and last I knew when people made responsible financial decisions in their life they SAVED THEIR OWN MONEY for their care as they got elderly. They didn’t EXPECT THEIR CHILDREN TO PAY FOR IT. She is at a rehab! The point of rehab is for her to GET BETTER and get back on her feet so she can go back home. I suspect a major part of her problem is that they are monitoring her medications and she’s addicted to pain pills. I have seen elderly in this position and I have had 31 years + experience with her addiction and I KNOW she can become impossible to deal with. She will have the most sane person in the world PULLING THEIR HAIR OUT! So she really has no say in where she is, when she is in the best place possible getting recovery hopefully going back to her apartment. Even if I went there, THERE IS NOTHING I COULD DO! I have a job, kids and a life here in Kentucky. She is in IOWA. She stole my childhood, my chance at having a mother who REALLY loved me. I don’t even know what a mother is or what a mother does?? I don’t know how a mother is supposed to be. The only way I have seen it is through others, and every time I see it I cry inside. I can’t even grasp what it’s like to have that close relationship with a mother but the closest thing I will ever have is my relationships with my kids and for them I am forever thankful. Minus having a mother, I have done my best to be a good mother to my kids. YES, I’ve made mistakes. A LOT OF THEM. But I’m trying to do better for them than what was done for me and I’m moving forward and for once I am putting myself and my kids first. My recovery depends on it!! I have spent the last 4 years working on myself by working the 12 steps over and over and doing so many things to CHANGE my life, for the better. I have made amends to people I hurt and asked for forgiveness as well as extended forgiveness to those who hurt me. My adoptive mother on the other hand, is never going to change and I’m 100% positive she will die the same way she is. She’s mentally sick, she ruins lives, and her own family says she was born with evil in her body. I wish things weren’t the way they were but because they are I feel no obligation at this time in my life to go running to my adoptive mother’s aide. I feel if she was ever in a place where she could no longer try to destroy people’s lives I might be able to consider it, meaning the later stages of her life when she is no longer able to manipulate. Perhaps she will be bed ridden, and her memory will be gone? She won’t be able to control her pill addiction, and her memory won’t remember who I even am. Maybe then I would consider it, if God calls me to do that. For now I will pass and know in my heart of hearts I can only give what I can give and right now all I can give is PRAYER! I am only 11 years into gaining my freedom back from being conditioned for 31 years of my life, and STUCK in a toxic disgusting relationship. I’m not ready to give my life up again for someone that took so much. I’m at peace with this decision. I do feel bad for my kids who have been robbed of a happy healthy grandmother, like I was robbed of a happy healthy mother. It never leaves my mind and I have deep rooted sadness regarding this loss, not only for myself but for my kids. For my fellow adoptees that have been in this situation, how did you handle it? I ran away to the other side of the world to get away from my mother. She is a toxic person and I understand all too well the pain of feeling like an adopted orphan and an outsider to two families. I got kicked out when I was about 18 for having a fork ( that you eat with), under my bed. My adoptive parents were great at forcing religion and forced attendance at church on me s d making me do all their second jobs X ( gardening/delivering papers to the paper boys and girls/pools rounds/cleaning/mowing lawns etc) and terrible at giving love. At the age of maybe 22 my Mum gave me a very bad hug but it was the first hug I ever remember getting from her. Just no love. I too feel hurt when I see mothers close to their kids. I never had that. The primal wound runs deep. I’m 40 now and still hiding out on 12000 miles from my Mum. I think I’m waiting until she dies before I go home. How sad is that? Like you with your Mum, mine makes my skin crawl. Her voice hurts my ears. I have to drink to be around her for any period of time. She has so many mental issues undiagnosed and so unresolved. Nightmare. I just put her out of my mind. My thoughts are with you during these difficult times. I’m so sorry you are going through it. Your pain and torment in response to this latest episode is real and should not to be minimized. My heart goes out to you and I send you this heartfelt prayer. Lord, bless Pam with the ability to accept the things she cannot change, courage to change the things she can and the wisdom to know the difference. My own story almost exactly the same! Thank you for sharing.Its healing to know you’re not alone!